My husband and I are actually going out of town tomorrow so I won't participate in day 5. So here's to the last day for me! Matt and I like many of the same hobbies. We both love to read, watch movies or TV shows on DVD (we don't have cable). We also like to be outdoors when it isn't crazy hot. We like to surf the internet. He loves "articles" and I like blogs, of course. We love to travel when we are able. We are currently in love with watching back episodes of Criminal Minds on DVD that we get from the library. We are also reading through all Newberry Award Winning Books since the years we were born. It's cheesy but fun for us! This update comes a little before the end of June BUT we won't complete any other goals before the end of the month. 91. Cook something new and exciting. (DONE 6/8/12; homemade poptarts!) These were amazing! 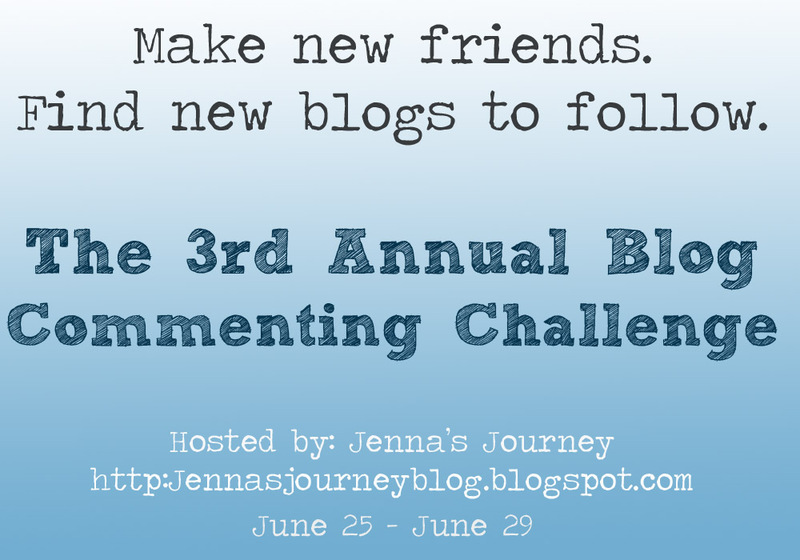 Today is day 2 of the commenting challenge. Yesterday was fun so I thought I'd do it again. Our blog is just about our lives. It's a way for us to keep a record of what is going on in our lives. Our first post was written on our honeymoon and it has chronicled parts of our lives since then. It's very fun for me to write about our journeys and adventures and I hope to use it one day to journal the lives of our children. It is also a way to keep family and friends updated. 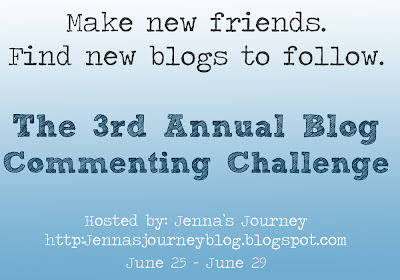 Our blog has a little bit of everything from recipes to crafts to day-to-day life stuff. I'm also spending a lot of time this year blogging about our "101 things to do in 1001 days" list. You can read further back in our entries to learn more about that. I love to use our blog to share things about our marriage. We knew when we got married that God wanted us to share our lives with other people and model a Godly marriage for others. 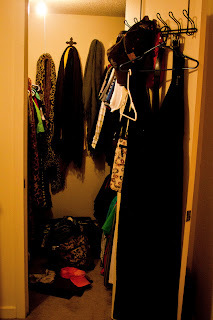 This blog is a small portion of that! 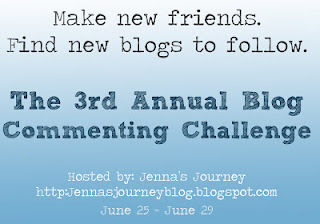 Linking up with Jenna's Journey for a fun Blog Commenting Challenge. Today's topic is all "About Me!" My name is Leslie. 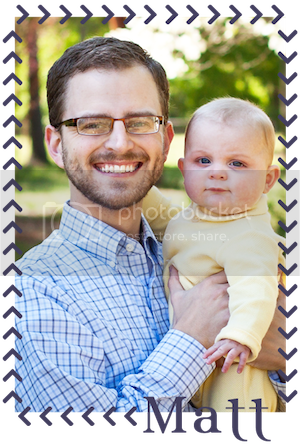 I live in Spartanburg, SC with my husband, Matthew. We moved here from Montgomery, Alabama on November 21st, 2011. I am originally from south Louisiana but have also lived in north Louisiana and Birmingham, Alabama as well. Matt is an Air Force Brat originally from New Jersey moved to Illinois and then Montgomery, Alabama. We LOVE our little city. We have been married for 18 months, since January 1, 2011. We both work outside of the home. 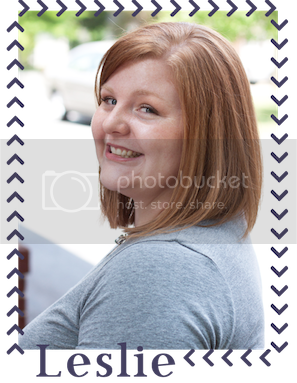 I am a Speech Language Pathologist and Matthew is a new photographer who also works at home depot. We don't have any children yet, although we look forward to filling our home one day! One pet, a fish named Splenden. As soon as we rent or buy a house, we will have a puppy dog. Have a busy week coming up so I won't have much time to blog. We are both working a good bit and then we head to Knoxville, TN on Friday for a few days to see The Moody Family and for Matt to take pictures of sweet Lela! Part 3 of this series which we are calling "The Future". We mentioned in our last series post that enjoy talking about our future. Obviously, we have no idea what the future holds but we like to talk about the plans we have for one day in the future, nonetheless. Matt and I both enjoy working. I love being a speech language pathologist and Matt is enjoying starting his photography business as well as working at Home Depot at this time. However, we would love to be in a place financially and just overall in our lives where we work less. We would love for Matt to be able to do his photography, for me to work PRN as an SLP and for us to support ourselves in other ways as well including making and selling crafts. It's a dream for sure. We have gone back and forth about this for a while and we know that we may change our minds again before we get to this point BUT as of right now, we plan to home school our children. Matt was home schooled and there were things he liked about it and things he didn't. Our goal is to teach our children as much as we are able and then be a part of a co-op so that they can also be taught things that we can't teach them as well. The only way that we will ever do this is if we are able to have our children involved in children's ministry, youth ministry, play groups, co-op etc so they are involved with their peers. We never want for our children to be isolated from their peers. We want to be able to travel more. We don't necessarily want to take huge, expensive trips but we would love to camp inexpensively, take our children and ourselves on mission trips across the nation and even the world. We love the thought of an across country RV trip to visit family and see the USA. Lovely lovely idea. Matt and I love our budget. We love knowing that we have a great amount of control over our finances because we prepare ahead of time. We hope and pray that we are able to continue this for all of our lives. There is so much freedom in that! Between the two of us, Matt is the more adventurous one. Because of that, he encourages me to be adventurous. With that in mind, we want to be adventurous with our children too. We want to always explore new things--cooking new foods, making new things, hiking, camping, etc. etc. etc. Matt and I love to cook and we want to pass that down to our children and grandchildren in the future. My grandmother was a great cook but I didn't learn much from her because I just ate the food :). Matt kind of had the same experience. We think that cooking with your children can be a great teaching experience. We can't wait for that! Matt has talked about having a garden since before we were married. 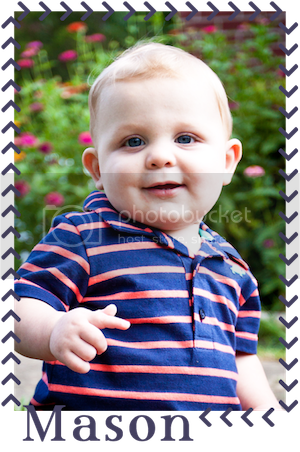 He is so good growing pretty much anything and he can't wait to have space to be able to do as he wishes. He wants a big garden that will allow for a large amount of fresh produce so that we can be more self sufficient. Of course, Matt and I want to have children of our own but we hope one day in the future to be foster parents and possibly eventually adopt children that are in the foster system. So there you have it. Just a brief look into our thoughts about the future. I love to watch movies but honestly, I don't remember specific lines from Many of them. I'm going to go with "It's so fluffy I'm gonna die" from Despicable Me. Also, a special movie because Matt and I saw it on the day we got engaged. I linked up with Kelly's Korner two weeks ago for "Show us Your Living room". Last week it was kitchens and our kitchen in our apartment is SOOO small so I skipped that week. 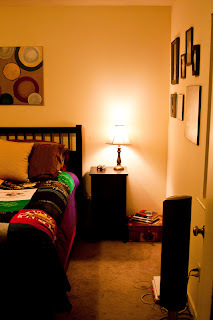 This week it's a tour of bedrooms. This is our bedroom. Our apartment has two bedrooms but our spare bedroom is being used as our craft room right now too and it's nothing special. Maybe I'll show it one day :) Enjoy the tour of our small yet great space! This is our bed. 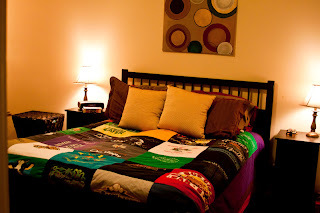 The quilt on our bed is a t-shirt quilt that our dear friend, Keva, made for us. We normally have a brown comforter on the bed but for the summer this quilt is perfect plus, it's special! The picture above our bed was painted by another great friend, Mandy. Our sink is in our bedroom. So cool...NOT! 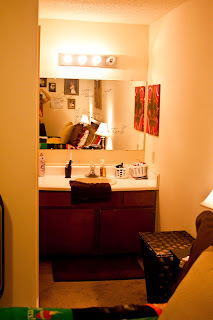 The messages on the mirror are love notes we write to each other. 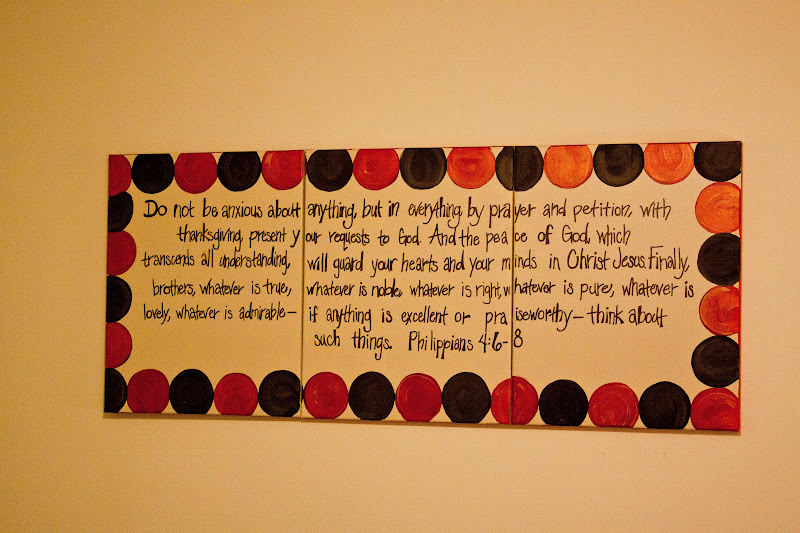 This scripture is our Morgan Family life verse. Mandy painted it too. We both love it. It's on the wall opposite of the window. 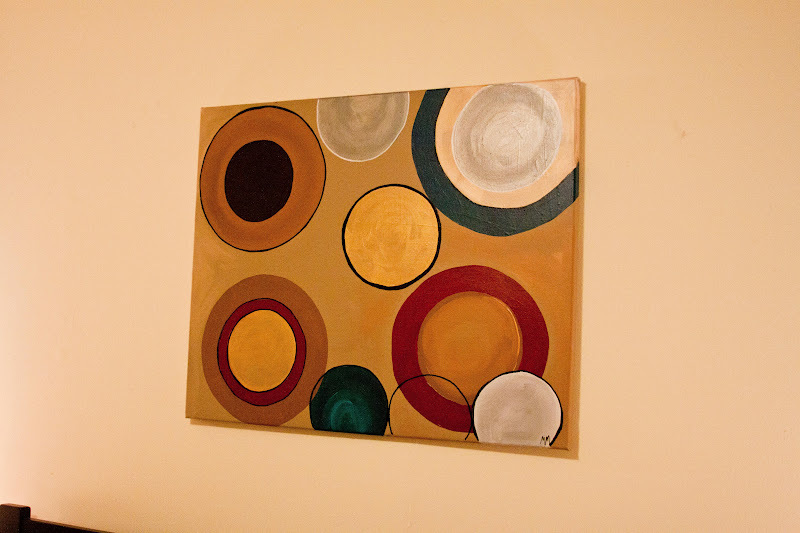 An up-close of the painting above our bed. Our dresser, mirror and our TV with our current guilty pleasure playing :). 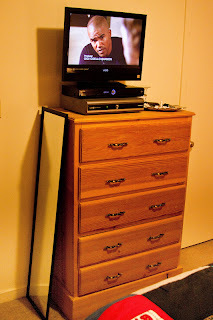 The dresser is at the foot of the bed. Our closet. Small but functional for us. This door is right next to our dresser. This is "our" wall. 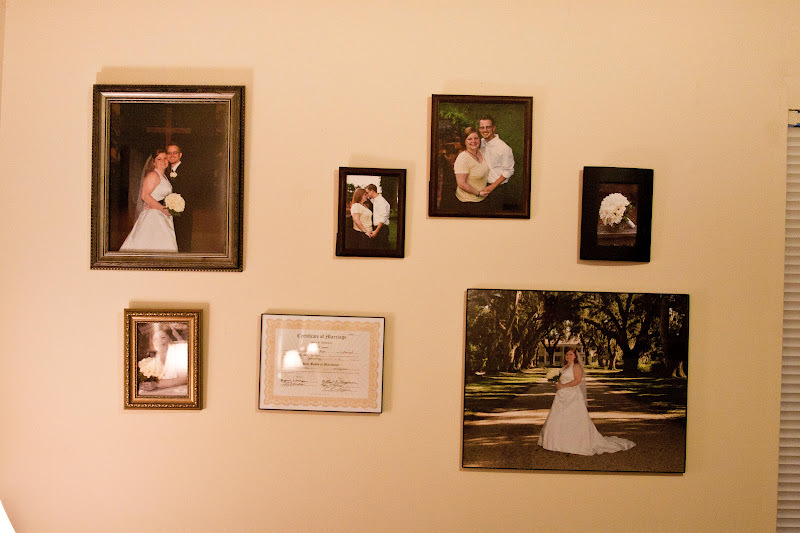 Pictures of us, bridal, engagement, and wedding. Wedding license too. We love our room and hope you do too!